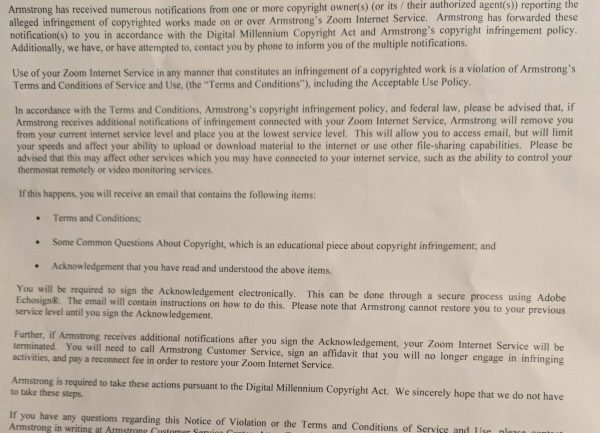 Armstrong Zoom, a northeastern US ISP with about a million subscribers, has sent its customers warnings that they have been accused of copyright infringement, and that subsequent accusations would lead to having their network connections slowed to the point of uselessness, which could impair their ability to control their internet-connected thermostats. In the regions in which Armstrong Zoom operates, a malfunctioning thermostat in winter could result in frozen pipes, floods, and death of pets and even people. Note that the punishments Armstrong Zoom is threatening have no due process, and the customers are considered guilty without even the chance to prove themselves innocent.